Why do we name things? We put enormous time and energy in deciding on our children’s names, the branding of our business, the naming of our towns and cities, a newly discovered plant or animal species, new technologies and diseases. You name it, we name and label everything! But ‘why’ is the question that we should be asking. I would venture to suggest there are different motives and purposes that determine this, including the subject of the naming. With a child, it could be a name passed on from generation to generation, or something about them that shouts that name. With a brand it could be to stand out or to blend in – some brands challenge thought, whilst others promote easy assimilation and acceptance. And so the naming motive list goes on. The specific naming I would like to question though is: why we give streets, avenues, roads, lanes, cul de sacs and crescents that we live in, certain names? Presumably the name often reflects founding families of the area, or it could refer to leaders from various walks of life. 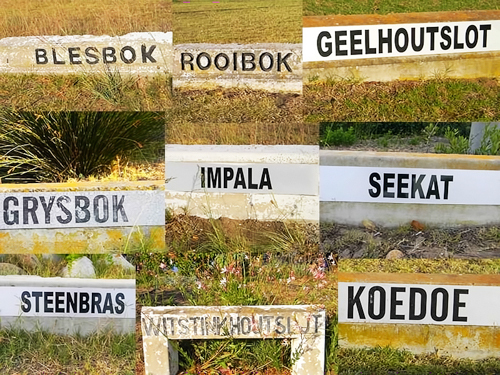 Many times though the street will bear the name of a fellow creature or plant species – our suburbs are overgrown with streets named after protea, erica and other fynbos species; or fauna names such as ‘Impala’, ‘Bontebok’ and ‘Grysbok’ bound through my mind. Which brings me to my next question: why do we adopt these names? Is it in reverence or admiration of these creatures? Is it in remembrance perhaps? Did they once walk and grow up here, but no longer? Are we playing pretend that they still do? Firstly, naming streets after us, does nothing to protect us. Protection requires action, not naming. After all, the paint on a block of cement on the corner of a street, is after all just paint on a block of cement on the corner of the street, isn’t it? Or did you intend it to be an epitaph on a tombstone? Protection means actual effort. Such as cleaning rivers choked by plastic, nappies, fishing line, condoms, cigarette butts and broken bottles or taking responsibility for yourself and others to ensure it never ends up in the rivers, sea and bush in the first place. It does require getting off the sofas that are slowly moulding to a permanent shape of our bodies, walking out the front door and doing something that contributes to our community and environment – proper. Otherwise naming your streets after us, is at best patronising, and at worst rubs salt into the deep wounds of a natural world that is either extinct or long left your pretty suburb. Secondly, we are still here. Barely. Although the lions, buffalo, hippos, rhino, giraffes and just about any creature over five kilograms has been vapourised or relegated to demarcated areas, some of us are still here trying to share what was once only our back yard, begging the question whether you will notice we even exist. Thirdly, be honest. Gathering by the speeds you drive through what remains of the conservancies along our coastline, you might as well name the streets ‘Road Kill’ Lane, ‘Spoedvraat’ Street or ‘Road Hog’ Highway? Seeing a tortoise or guinea-fowl ambling across the tar shouldn’t trigger the sudden urge to accelerate in order to hear the cute pop we make as your vehicular (petrol or diesel) propelled unit drives over us, or is that merely normal human behaviour? Or simply stop naming streets after anything natural at all. Here are some possible options that should resonate much longer in relevance: ‘3G for Free’ Avenue, ‘Plastic Paradise’ Road, ‘Viking Conqueror’ Lane or ‘Sterile Mile’ Drive? At least wear the badge with pride. If this is to be the path of apathy we choose to totter along vis-à-vis our natural environment, I – for one – would prefer to live in a place where the streets have no name.